This entry in the Why This Book Should Win series is from reader, reviewer, and BTBA judge P.T. Smith. Naivo’s Beyond the Rice Fields is the first Malagasy novel ever translated into English. That’s no reason to win the BTBA, but it’s a damn lovely thing, isn’t it? Let’s take a moment and appreciate just what it means for international literature. It’s doing well, seeking out what’s been missed, what countries and cultures are passed over. Yet it also shows the lag. That a book this fantastic, good enough to make the BTBA longlist, is the first to come into English from a country suggests that country probably has other impressive works we’re missing out on, and that other countries, whether anything has landed in English from them or not, also have works it’s unfortunate we’re missing. Not everything can make it to English, obviously, but this type of book is simultaneously encouraging and discouraging. All of that is well and good, but why should Beyond the Rice Fields? Well, books like this are rare. It’s a book meant for a wide audience, but one that doesn’t sacrifice intelligence or complexity for that audience. Naivo and translator Allison M. Charette tell the history of a changing culture in Madagascar through the intimate lens of two people, a slave, Tsito, and Fara, the daughter of his master. In the early nineteenth century, missionaries and industrials arrive from Europe, from England and France, vying for influence and control of the ruling class and of the people. As these two grow from children to adults, the world around them changes dramatically. Christianity grows and grows, sometimes in favor with the monarchy, sometimes violently persecuted. Political alliances are uncertain, and that uncertainty is incredibly dangerous. A country once made up of small communities is becoming centrally ruled, with consequences for many. It’s a time when a slave can find his way to freedom, yet remain loyal to his master. Naivo shows the nuances, the excitement, and the terror of all this, without ever being pedantic, without losing the thread of an epic, entertaining story. Tsito and Fara drive that story. The narrative switches between the two of them, their childhood friendship and play, the closeness that develops as they transition to adulthood, training together for a ritual performance and competition, and the separate paths their lives take. They break and come together again and again. It’s a love story, after all. But Naivo isn’t beholden to the structure of a love story, does not let it become trite. That’s the real impressive move of the book, that as much as it’s historical fiction, a love story, the story of the country boy going to the big city, it’s not just those things. None of those things put demands or limits on the other, and they avoid cliché. 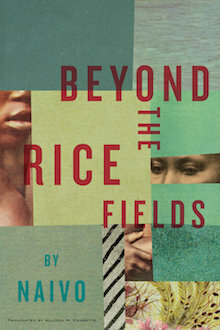 Beyond the Rice Fields deserves to win the BTBA because it’s beautifully written and translated, because it brings to life a landscape and a time period, because it creates complex, engaging, flawed characters, because it lets a reader glimpse history, because the story is intricate, where little pieces, of plot, of character, connect in wonderful ways. It’s a book that readers of varied taste can love.